The formation of this landscape finds it roots in the monasteries of the Middle Ages, when fish-farming became a means of living for locals and monks alike. As the region was quite poor, fish became an affordable means for the population to consume protein. 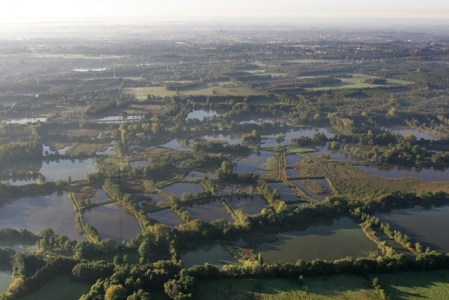 Over the centuries, this fish-farming system created a network of interconnected ponds and canals that could be drained individually; an empty pond being much easier to recover the farmed fish from. Simultaneously, this seasonal emptying allowed for the establishment of a unique ecosystem that houses many rare plants and animal species. Among these is the tree frog, a small green frog that breeds and grows up in the water, but spends it adult life ashore in (preferably) bramble thickets. Another major element in landscape development was the construction of mines for iron ore in the area – requiring both food (fish) for the workers as well as wood for the construction of mineshafts. Evidence of the latter can still be seen in the pine forests that grow in the sandy soils close to the ponds. Unfortunately, the last few years have seen a decline in fish-farming in the region, both as a consequence economic reasons; an increase in regulatory burden and lower consumption of carp and other fish. As a result, many of the previously maintained ponds were slowing turning to land, as the shallows filled up with sand and willows established themselves. Part of the LIFE+ 3watEr’s efforts was to restore these ponds and canals to their previous condition, as well as opening up the landscape by removing scrubs and trees from the dikes – this does not only help many bird species, such as the bittern, to move from pond to pond, but it also restores the ‘old look’ of the area when private, often economic, interests kept the landscape open for better access. After four and a half years of effort, one of the more interesting consequences was that some younger people who knew the area thought that we had near-vandalised it, many older visitors stated that they ‘recognized’ the landscape again. One of the vital conditions of creating this EU co-funded project, where the full cooperation from the local organization of private landowners represented a European first, was that the (restoration) actions and further maintenance of the area would not seriously impede economic activities. Through the creation and adoption of the 3E model, wherein Ecology, Economy and Education were held as equally important, the right results were achieved and demonstrated that commercially viable activities such as forestry and fish farming can still take place right alongside, and often in combination with, environmental protection. In the end, the unique collaborative approach between the seven active partners was rewarded by the first Natura 2000 Award for ‘reconciling interests and perceptions’. The LIFE+ 3watEr project demonstrates that old landscapes can be given new purpose through a combination of restoration and smart commercial use. For a short documentary visit https://www.youtube.com/watch?v=rQdvnBuu7js or go to the project website at www.3water.eu.